Sometimes you need to up your spaghetti game plan. Plain old spaghetti can get pretty boring very quickly to the family. 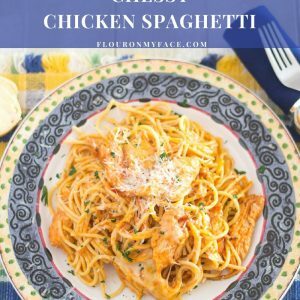 This Crock Pot Cheesy Chicken Spaghetti recipe is a great way to save money and still serve up a plate of something delicious at dinner time. I love the added flavor that cooking chicken in spaghetti sauce can add. When I was a kid my mom would cook a big pot of pasta sauce with cut up pieces of chicken in it. She would simmer it most of the day. The sauce would have a wonderful chicken flavor to it. The bad thing about the way mom did it is that there was always a chance someone might find a chicken bone in their plate of spaghetti. 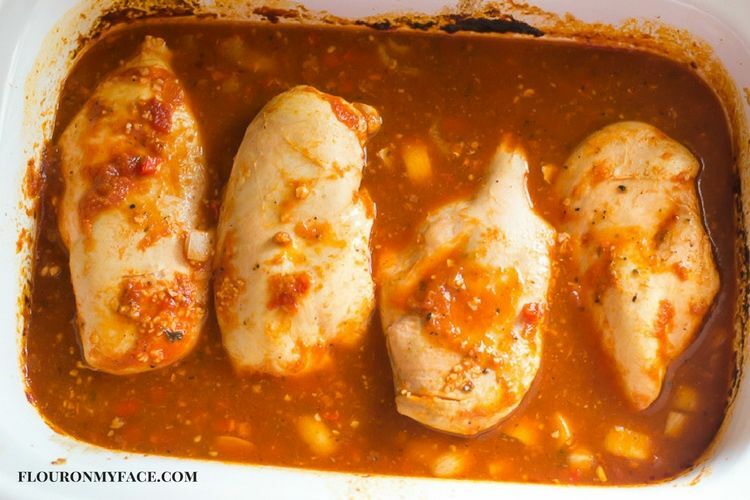 I don’t like to take a chance like that so I decided to use my trusty slow cooker to cook a few boneless skinless chicken breasts in one of my favorite jarred pasta sauces. You might be more familiar with chicken spaghetti made with Velveeta cheese and rotel tomatoes. My recipe is a little different. No Velveeta or Rotel in this crock pot chicken spaghetti recipe. 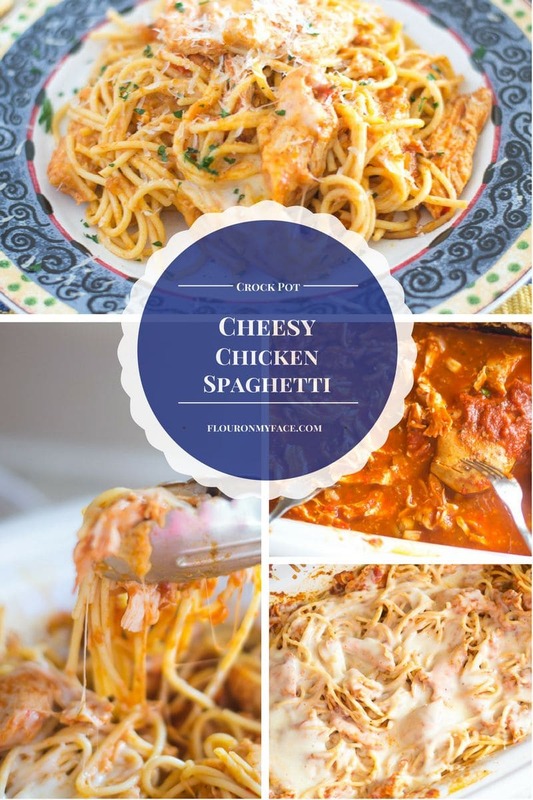 My Crock Pot Cheesy Chicken Spaghetti is made with a jar of red sauce. 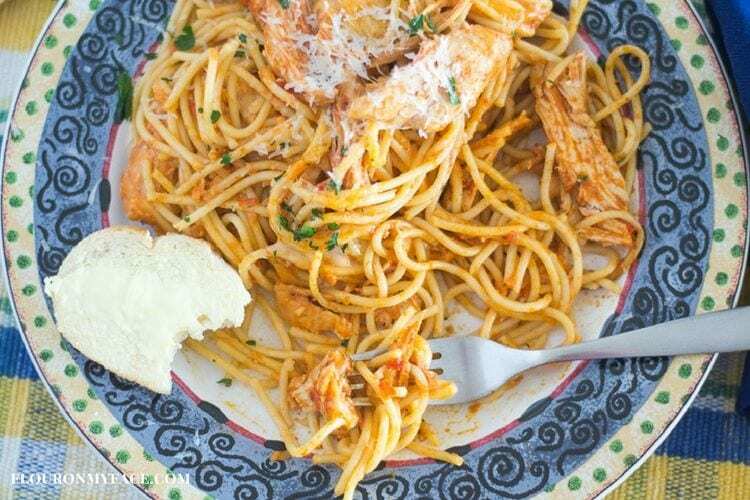 You can use your favorite pasta sauce for this slow cooker chicken spaghetti recipe and top it off with some shredded mozzarella cheese. Just like good old fashioned spaghetti should be made. I love cooking chicken with spaghetti sauce and topping it with mozzarella cheese. I love to top my spaghetti recipes with a layer of mozzarella cheese. One of my easiest and cheapest dinner recipes I have made for my family over the years is my baked spaghetti recipe. When you need to stretch those meal planning dollars spaghetti is the perfect family dinner recipe. If it wasn’t for that layer of mozzarella cheese on top of my baked spaghetti with meatballs or my easy baked spaghetti with meat sauce my family would probably never have eaten it. Cheese makes everything taste better. Spaghetti is a very budget friendly dinner recipe to add to your menu planning that everyone will love. 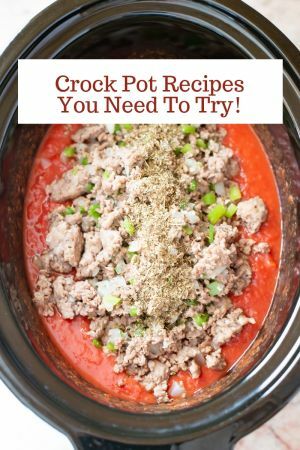 Place the diced red pepper and onion in the bottom of the crock pot and arrange the chicken pieces over them in a casserole or 6 quart crock pot slow cooker. Spread the minced garlic over the top of the chicken breasts and sprinkle with ground black pepper. 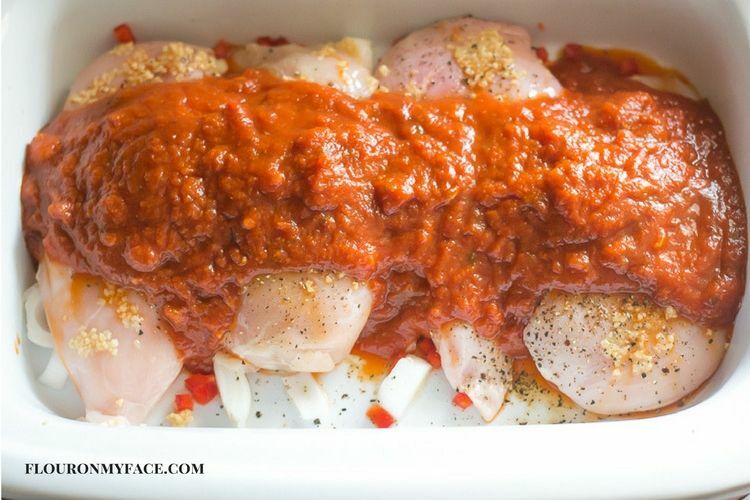 Pour half the jar of sauce over the chicken and cook for 4 hours on high or 6-7 hours on low. (cooking time will vary depending on thickness of chicken. 15 minutes before chicken is done cook the spaghetti noodles following directions on package. Drain and rinse the pasta well. Pull the chicken pieces apart into bite size pieces. Add the remaining sauce to the crock pot. Add the pasta to the crock pot and toss until coated with sauce. Sprinkle the mozzarella over the spaghetti and recover crock pot. Heat until cheese is melted, about 10 minutes. minutes before chicken is done cook the spaghetti noodles following directions on package. 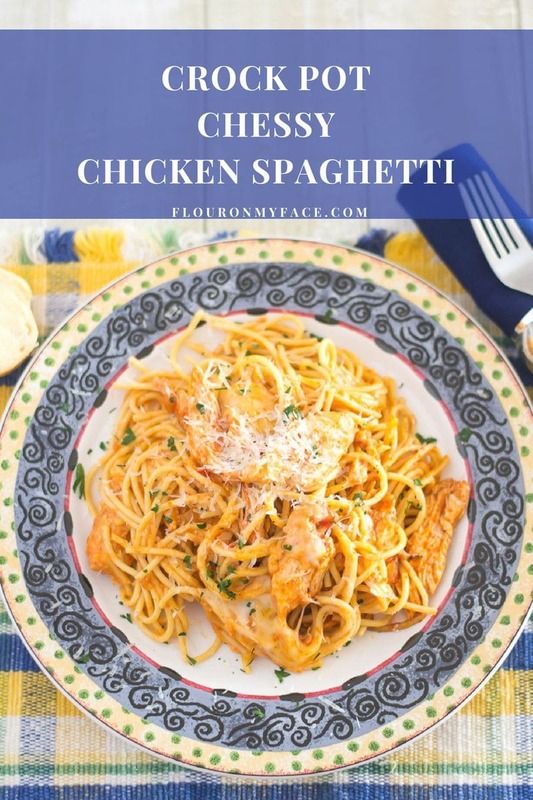 If you love this Crock Pot Chicken Spaghetti recipe then you will love my Crock Pot Recipe page where you will find 130+ Crock Pot recipes. 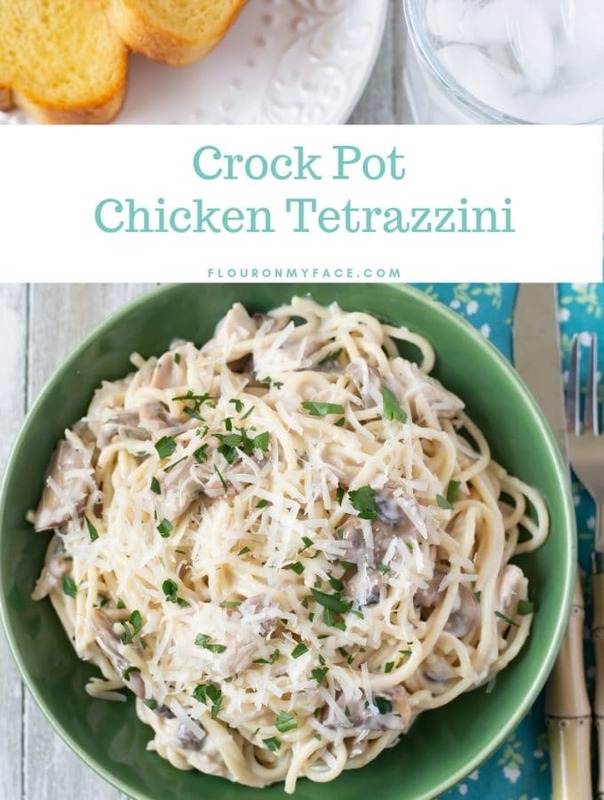 Your recipe for chicken and spaghetti sound great but can you cook the pasta in the crock pot also? I haven’t tried cooking the pasta in the crock pot with this recipe. But I have made Crock Pot Baked Ziti and Crock Pot Macaroni and Cheese and cooked the pasta in the slow cooker. I think you might need a bit more pasta sauce to cook the spaghetti noodles with the recipe. If you try it let me know how it goes. Your recipe for Crock Pot Cheesy Chicken Spaghetti sounds delicious. I’m going to try it with gluten free pasta. 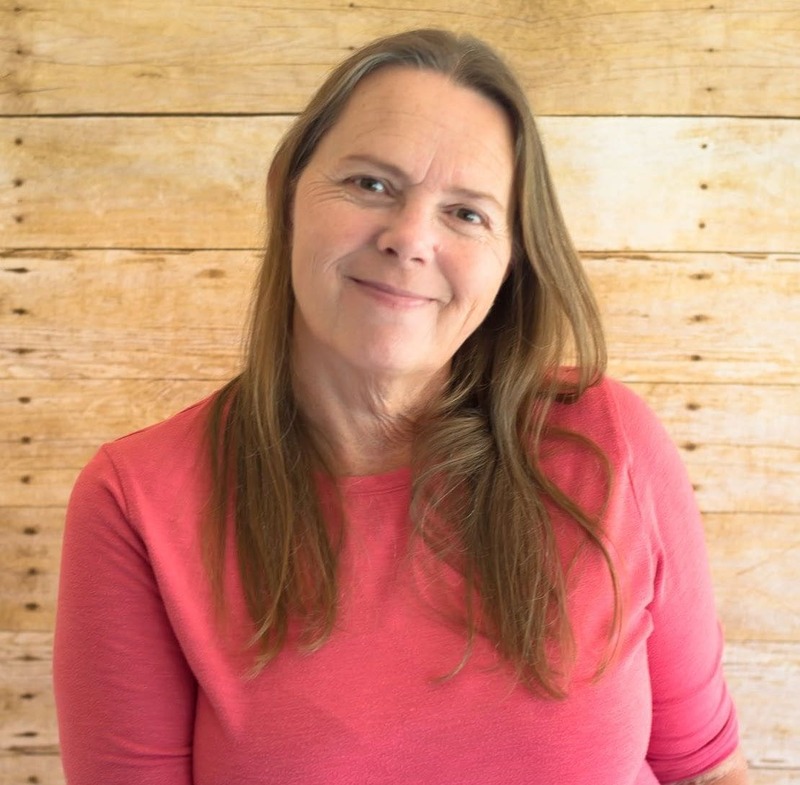 Do you ever do gluten free recipes? I laugh as I ask this due to your title of Flour on my Face! I love flour, but it no longer loves me! 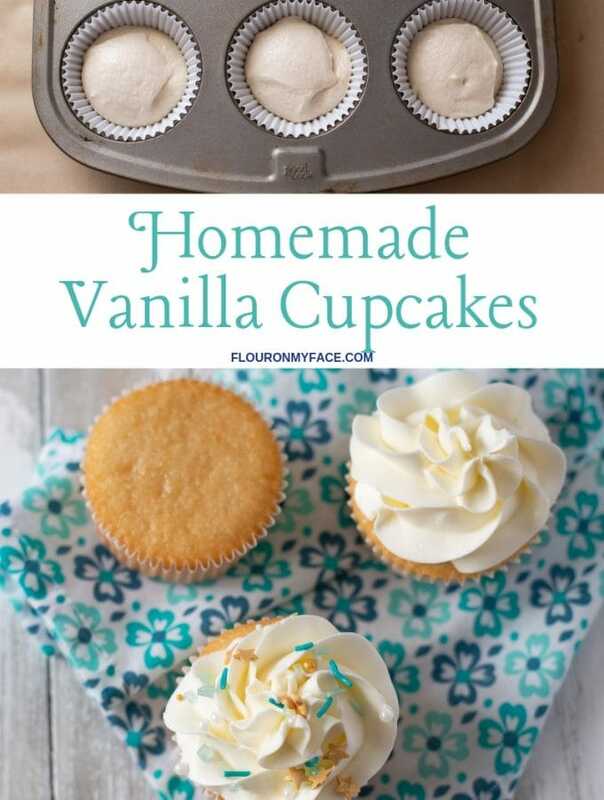 I go occasionally share gluten free recipes. You can use the search bar to find them. 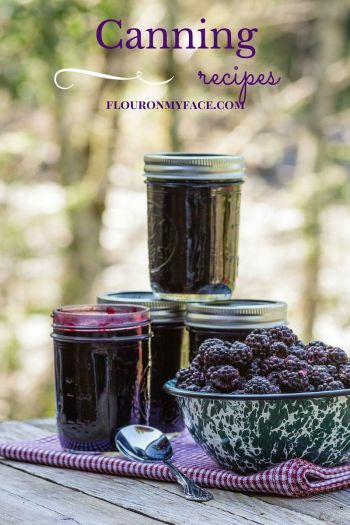 I just shared a gluten free and nut free cookie recipe. 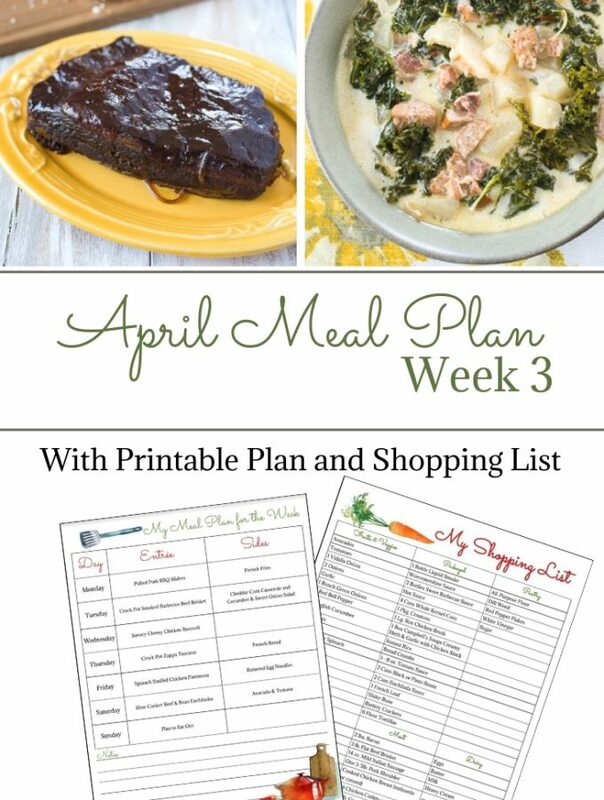 I love how easy this recipe is to make and I can totally see myself putting this on my weekly menu. Thanks for sharing on Merry Monday. Pinned.